The Heathcote Combined Community Facility incorporates a voluntary library and community hall that were previously located on separate sites. The original facilities were damaged in the Canterbury earthquakes of 2010 and 2011 and the Christchurch City Council, in consultation with the community, decided to rebuild the two facilities on one site adjacent to the Heathcote Domain. The community asked for an accessible, multi-purpose building that was inviting to youth and capable of hosting different groups concurrently. A place that minimised maintenance and operating costs, was built sustainably and was efficient in its energy use. 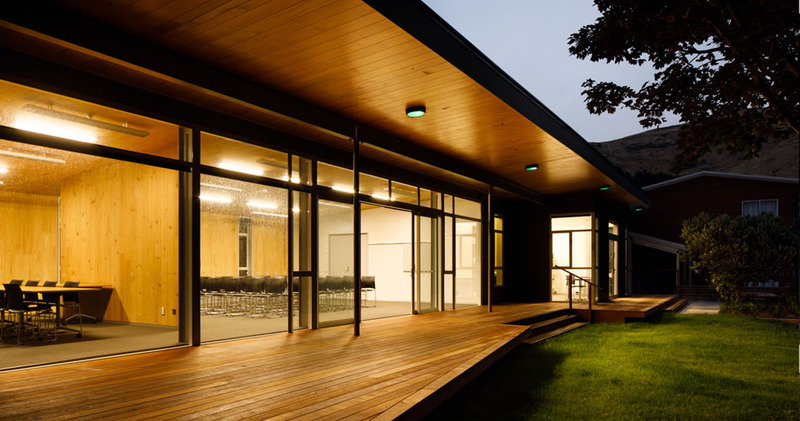 The resultant building provides a welcoming open and flexible series of indoor and outdoor spaces that maximise views down the valley and orientation to the cricket field and afternoon sun. Shelter and shade are provided by a large over sailing roof and modulation of the facade materials and openings. The building incorporates a combination of timber and steel elements, and utilises innovative XLam cross laminated timber for large portions of the structure and interior linings. Externally the building is clad in a combination of cedar and fibre cement sheets with large areas of high performance glazing.